Today is Global Handwashing Day! Global Handwashing Day is celebrated annually in over 100 countries around the world where initiatives are carried out to raise awareness about the benefits of handwashing with soap. Do you know that more than 2 million children die before their 5th birthday due to diseases such as diarrhea and pneumonia? According to the World Health Organisation, diarrhea is the 2nd largest cause of death in children under 5 years old. More than 80% of these deaths occur in South Asia & Africa, the primary regions for Global Handwashing Day activities. The sad thing is that such diseases could have been easily prevented through the simple act of handwashing with soap! Washing our hands with Lifebuoy handwash, which kills 99.9% of germs in just 10 seconds! So for this reason, Unilever, through its brand Lifebuoy, has been working with the Millennium Villages Initiative to educate children on the importance of good hygiene across 10 countries in Africa for the last 5 years. This year, they have also taken on the ambitious challenge of ensuring that these young children reach the age of 5! 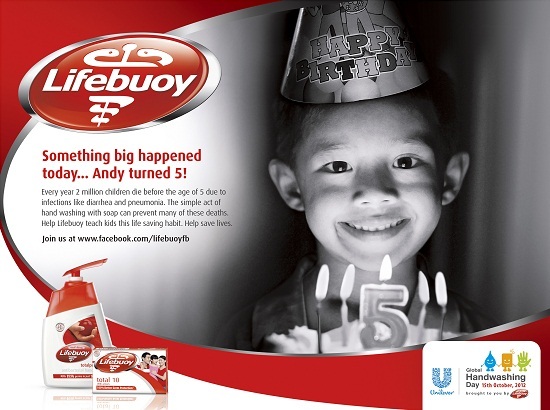 You can join Lifebuoy in their quest to save the lives of millions of children by Pledging Your Support! With every pledge received, Unilever will commit to teach a child on proper hygiene through a partner with the Unilever Foundation. You can help save the lives of millions of children around the world just by pledging your support on Lifebuoy's Facebook page! Disclosure: This is a sponsored community awareness advertorial on behalf of Lifebuoy Singapore. All opinions are my own.